LONDON, June 12, 2007 — In the land that produced "Scoop," Evelyn Waugh's novel of journalistic ambition and ineptitude, it would seem unsurprising for politicians to criticize reporters on occasion. But was it justified, as Prime Minister Tony Blair did today, to call the press a "feral beast?" In seemingly full-throated roar, Mr. Blair used one of his last speeches in office before he is to step down in 15 days to settle scores with a press corps that he said has hounded, badgered, blustered and bludgeoned the nation's leaders since he came to power 10 years ago. "The fear of missing out means today's media, more than ever before, hunts in a pack," Mr. Blair declared in a speech organized at the offices of Reuters, the news organization, in London. "In these modes it is like a feral beast, just tearing people and reputations to bits. But no one dares miss out." He quoted from a past prime minister, Stanley Baldwin, who borrowed an expression from Rudyard Kipling to equate the press' "power without responsibility" to "the prerogative of the harlot through the ages." Mr. Blair evoked the memory of two other former prime ministers, Gladstone and Disraeli, to vouchsafe that he was not the first leader to face "extraordinarily brutal treatment" in the press. "I've made this speech after much hesitation," he said. "I know it will be rubbished in certain quarters. But I also know this has needed to be said." He added: "A free media is a vital part of a free society. But it is also part of freedom to be able to comment on the media." His targets were quick to respond. "I think by and large the British press is pretty good," said Trevor Kavanagh, the former political editor of the top-selling Sun tabloid. "I think it does its best to be level accurate and sensitive to the requirements of both the people it writes about and the people it writes for. This was a very strange speech." Mr. Blair dwelled on changes in news reporting, including the impact of websites on traditional newspapers and broadcasters and the introduction of a rolling 24-hour news cycle, to complain that "the media are facing a hugely more intense form of competition than anything they have ever experienced before. They are not the masters of this change but its victims." 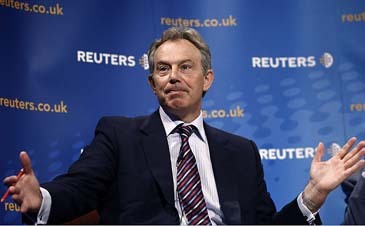 Mr. Blair added: "he result is a media that increasingly and to a dangerous degree is driven by 'impact.' Impact is what matters. It is all that can distinguish, can rise above the clamor, can get noticed. Impact gives competitive edge. Of course, the accuracy of a story counts. But it is secondary to impact." Mr. Blair's relationship with the British press has long been complicated. He became known for courting Rupert Murdoch's News Corp., whose British assets include the top-selling Sun tabloid, and for the aggressive press policies pursued by his onetime communications director Alastair Campbell. Mr. Blair admitted today that, initially, his government paid "inordinate attention" to "courting, assuaging and persuading the media." But his focus on the press did not bring respite from criticism. While the prime minister has been credited with a talent for the telling phrase, the deft sound-bite, and the impassioned oratory with which he has fought three elections and as many wars, his administration has also been accused by media organizations of resorting frequently to "spin" as a means of courting public favor. At a news conference with Mr. Blair in Washington last month, even President Bush seemed to reprimand British reporters for "trying to do a tap dance on his political grave" after questions from them about the final days of the Blair era. Even by those standards, Mr. Blair's criticism today seemed unusually blunt, as he assailed sensationalism, "the confusion of news and commentary," an alleged lack of balance in British reporting and over-simplification. "Things, people, issues, stories, are all black and white," he said. "Life's usual gray is almost entirely absent." "Is it becoming worse? Again I would say, yes. In my 10 years, I've noticed all these elements evolve with ever greater momentum," Mr. Blair said. He continued: "I do believe this relationship between public life and media is now damaged in a manner that requires repair. The damage saps the country's confidence and self-belief; it undermines its assessment of itself, its institutions; and, above all, it reduces our capacity to take the right decisions, in the right spirit for our future."